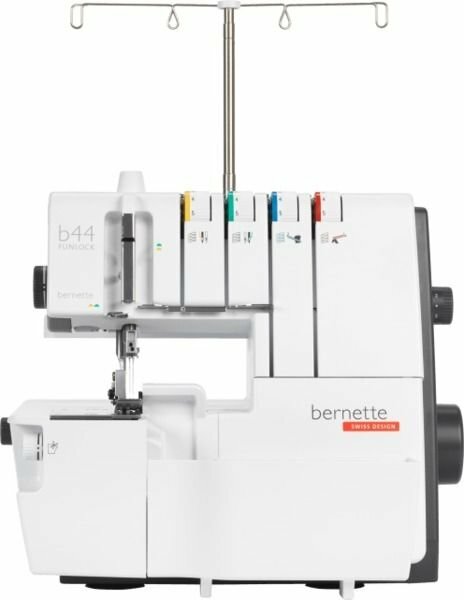 The bernette b44 Funlock Overlock Serger offers numerous practical functions, giving you a straightforward introduction to overlocking. With 15 stitches, the bernette b44 Funlock Overlock Serger provides a compact set of stitches that allows you to do all types of overlock sewing. The bernette b44 Funlock Overlock Serger is easy to thread the looper and needle by following the coloured markings on the bernette Funlock 44. The knife drive is from below, so the stitch widths can easily be adjusted with one hand. The bright LED light also provides good visibility. And the bernette b44 Funlock Overlock Serger is quick, sewing up to 1300 stitches per minute. Ribbon Couching foot – For couching narrow ribbon. With the help of the adjustable guide, ribbons of various widths can be guided precisely into the seam. Elasticator foot – The elasicator foot is best suitable for sewing projects with elastic bands. The Fabric can be aligned evenly and exact so the sewing of elastic bands for home furnishings, bathing or sports clothes goes smoothly. The elasicator foot is also optimal to create professional lingerie. Blindstitch foot – This foot is a specialist for working with blindhems. In one step the seam is sewn, and the edge is finished. Therefore, the blindstitch foot allows quick and Proper working and is ideal for creation of attractive blindhems on home furnishings and garments. Piping Foot – The piping foot is qualified for creating or sewing in braids, or even both actions in one step. That gives main points to home furnishings or garments. Beading and Sequin Foot – For creative work with beaded or sequin tapes up to a width of 4 mm. The side groove serves as a guide and for couching cords. Gathering foot – With the gathering foot single layers can be gathered evenly and simultaneously sewn on a smooth piece of fabric. LED lighting illuminates the sewing area. Easy to turn and adjust thread tension dials. Color-coded threading paths, along with a threading diagram inside the looper cover, ensure accurate threading every time. All four tensions are released when the presser foot is raised making it easy to thread and move a project from underneath the presser foot. Easily adjustable with one finger, fabric edges are trimmed safely and accurately. The knife in a lower position opens up the sewing and looper area for ease in threading. Lower looper threader aide helps in the quick threading of the lower looper. A strong motor provides quiet power. Easily attachable cut-off bin catches threads and fabrics while overlocking. Accessories easily store away in the looper cover. Exterior knob allows for stitch length adjustment while overlocking. 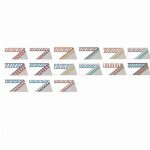 A wide range of seam widths for utility and decorative overlock stitches. By simply adjusting the knob the presser foot pressure can be adjusted to accommodate sheer to thick fabrics. Exterior knob allows for differential feed adjustment while overlocking. Upper looper convertor included to easily allow 2-thread overlock stitches. Simply move the rolled hem lever to switch easily to a rolled hem stitch and back again—no need to change the stitch plate or presser foot. Safety switch for looper cover ensures safety by not allowing machine to stitch when looper cover is not engaged.